During the last couple of years, bitcoin-based gambling has become more and more popular, given the wide variety of the benefits that the digital currency has, along with its ever-growing value. However, choosing the perfect bitcoin casino to spend your time on can be quite difficult, as the market is filled with numerous companies that claim they offer one of the best services around. At this moment in time, Crypto-Games represents the bitcoin casino of choice for hundreds of thousands of people throughout the world, considering the fact that it doesn?t only have a high number of games, but it also provides awesome features, alongside with a great customer experience. During its years of service, over 800 million bets have been made on the site. With this in mind, Crypto-Games?was established back in 2014, and is most popular for offering the highest bitcoin faucet among all other casino websites: 500 satoshi at first, which grows up to 20,500 every three minutes, which is great, especially for players who don?t want to invest their own money, but still want to play and potentially generate some extra bitcoin. Currently, the casino has a total of six games, these being Dice, Blackjack, Slots, Lottery, Video Poker and Roulette. All of these games are meant to offer players a unique experience, as the clients have complete control over most of the features being offered, such as win chance, the amount being bet and more. Together with this, the games employ complex cryptographic measures, in order to be fully provably fair for players, thus showing that no third party has influenced with the results of a roll. Yet another great benefit of Crypto-Games resides in the fact that they do not only accept bitcoin, but rather a total of 9 digital currencies, these being Bitcoin, Dogecoin, Ethereum, Litecoin, Dash, Peercoin, Gridcoin, Monero and Playmoney. In terms of the payment process, to be able to begin playing, you?ll have to wait for at least one confirmation after you?ve made your deposit. 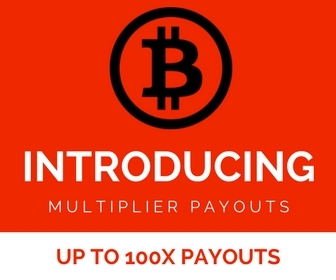 Withdrawals are processed instantly (if you have received your confirmation on the deposit), and are free of charge, as the casino is willing to cover all associated taxes and miner fees. Perhaps another great feature is the existence of the inbuilt exchange on the platform, which allows users to easily exchange from one digital currency to another, without having to contact third parties. Crypto-Games is also popular for its wide variety of promotions, bonuses and jackpots. With this in mind, it has a progressive jackpot at dice, currently situated at 2.7 BTC. It also has a wagering content, where the 3 players who wager the highest amounts of bitcoin within a month get rewards of up to 0.35BTC. Last but not least, there are also huge monthly lottery draws, of over 4,500 tickets for the top 10 wagering players for the previous month. Security on this casino is also a bliss. Crypto-Games goes extra lengths to ensure that all transactions are secure, and that player deposits are safe at all times. Together with this, the casino is also anonymous, as the gambling account is automatically created upon visiting the website, and does not require users to submit personal details, such as their name, or email. Those who do wish to secure their account can go ahead and add in an email, password and even two factor authentication. In terms of the platform?s design, it is meant to be responsive and easy-to-use at all times. Not only this, but Crypto-Games is also supported on online devices, so you can easily play most of the games on your tablet or smartphone. Based on everything that has been outlined so far, Crypto-Games represents the online bitcoin casino of choice, available to players from all around the world (U.S. included), and which offers 6 fun games, excellent customer support and some of the best features available on the market.